The Flexible Cobra cable features a tough cable encased in weatherproof plastic. 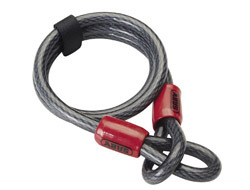 The versatility of this cable makes it popular with cyclists, sailors, farmers and businesses. The lasso design allows each end to be threaded though one another and increase the length if required. Remember to use a high security padlock if you are securing valuable equipment. On our website we have one size of popular flexible cable but we hold numerous different sizes and codes. Please contact us for specific models or sizes. 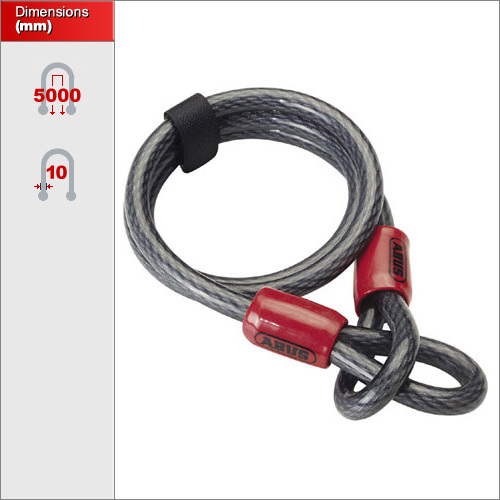 As a fully weatherproof cable it is ideal for prolonged outdoor used. It is popular with marinas and yacht owners to secure a range of equipment in highly corrosive environments. Its light weight also makes it idea for cyclists and motorbike owners.